The tools offered by Sumo are just so amazingly useful that if you don’t know about them I really want to introduce them to you. I found myself referring to them frequently throughout my book Create Your Own Website the Easy Way, and since I wrote it, the suite of tools – which I’ve come to find indispensable – has grown even more. And all of the tools I’m mentioning here in this article come absolutely FREE! First of all, it used to be a little bit of a hassle to configure a pop-up on your website. But now… Sumo makes it really, really easy. I know that you are probably saying.. not popups! I don’t want a popup on my website! They’re so annoying and people hate them! But the thing is that popups work. They are the absolute hands-down most effective way of getting people to sign up to your email mailing list. Sumo’s popups you can configure to only appear at certain times, every so often, or only when a reader is leaving the page, and not if a reader has already subscribed, or not if they’re reading on a smartphone, and so on… so they really don’t have to be intrusive or annoying. You can either leave it up to the system to detect when it’s a good time to make them appear, or you can control everything yourself. Take it from me that this works, because my Sumo popup form is the one that gets me the most people signing up from my website, out of all the different forms I have in different positions. You can also set popups to appear at the bottom of your website so they slide into one of the corners as the reader scrolls down (of course, you only set it to appear if they haven’t seen the other one)… now this can in no way be construed as intrusive, and it works well too… it’s the second most successful of my website signup forms. Other signup tools are a strip at the top of the page (called a “Smart Bar;” see below) which you can also configure as a simple button to take your readers to another web page, an embedded form right within your web page content, or – and this was one that you couldn’t do until recently without a paid-for program – a form that comes up when the website visitor clicks on a text link. Brilliant for including signup possibilities as part of your text, which is one of the best ways of having people sign up for more from you… when they’re already busy reading and enjoying your words. Finally, in terms of signup form possibilities, you can get a “Welcome Mat.” This is a full-screen subscriber form that the user sees before they go on to look at any of your content. You get lots of different templates and can add your own photo background so you can make a “mat” that looks really professional and inviting. 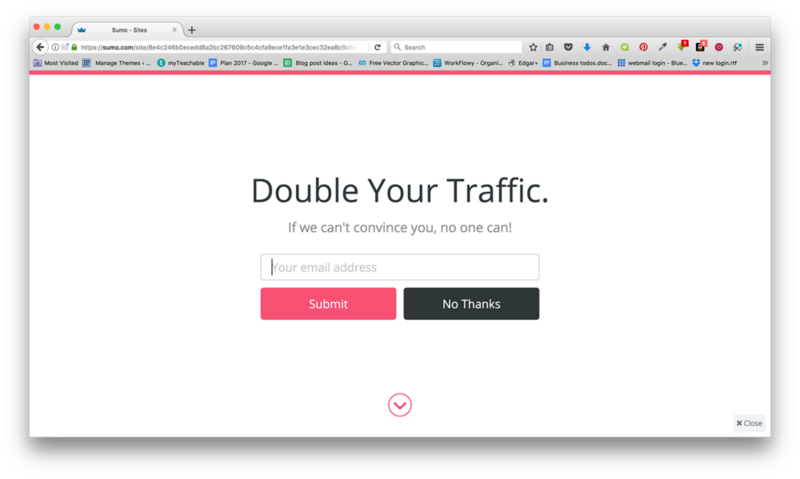 It’s up to you whether this kind of thing fits in with what you’re doing, but it’s a brilliant way to offer a discount coupon or some other irresistible giveaway, and they work astonishingly well to increase your signup rate. All these tools are amazing but what makes them even more amazing is that they come with a built-in autoresponder tool… and that is free as well. So now you can have the people who sign up get an instant, automatic email reply from you, and you can even send them an email attachment which could be a checklist or tipsheet, or whatever it is that you want to send them. You can also group-email people who have subscribed from within the Sumo interface, which could mean that if you’re just starting out, you can avoid setting up an email list manager just at the outset; although as your list grows, this will be something you’ll want to do. Unfortunately with a free Sumo account, you can’t connect directly with an email provider service such as MailChimp, so if you do use one of these you’ll find yourself adding your subscribers to your MailChimp (or other provider) list manually. For my part I’ve been using Sumo tools for a while and when I set up with them, this was part of the free package so I am lucky enough to have my subscribers added automatically to my list. But to be honest it isn’t really a big deal to have to do it manually and when you get to the stage when it is becoming annoying to do, that will mean your website is doing really well and getting hundreds of subscribers and you might want to upgrade to a paying account in any case. However, the autoresponder system will mean that your subscribers get an automatic welcome message from you in any case (once you set it up), even if your Sumo form isn’t connected to your email mailing list provider, and I think that is the really important thing. 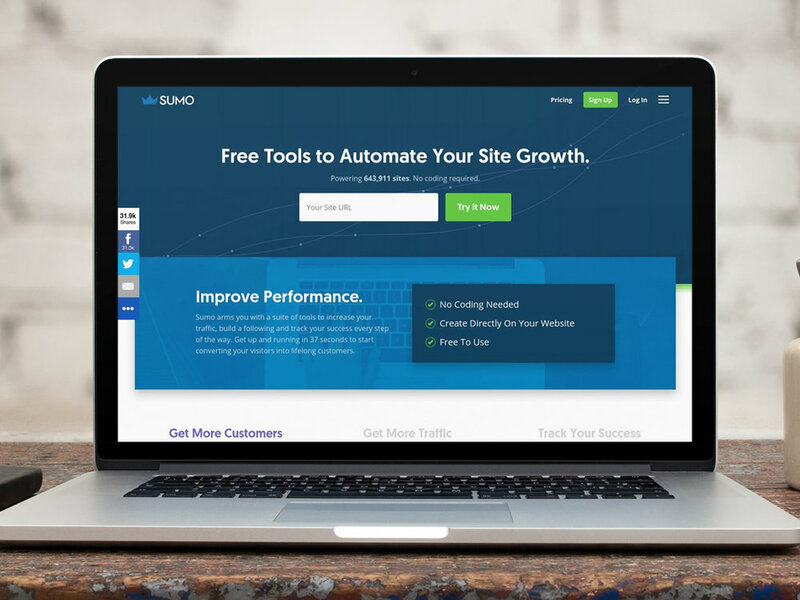 List-building tools aren’t everything that Sumo can do for you. The vertical strip of social media sharing buttons that you’ve no doubt seen all over the web (shown in the screenshot below) come from Sumo too. You certainly want to implement one of these so that your visitors can recommend your site to their own network when they find something of interest there. You an also configure a contact form on your website which is a brilliant way of getting interaction from interested people and building personal relationships with your site visitors. You can set it up so it’s a small tab that appears at the side of your website that’s easy to access and encourages people to interact (and it does; I’ve had loads of messages this way – I’ve had it set up on my online course page since I launched and that way have been able to answer dozens of potential students’ questions; see below, on the bottom right where it says “Any questions?”). I strongly advise you go to https://sumo.com and have a look for yourself. 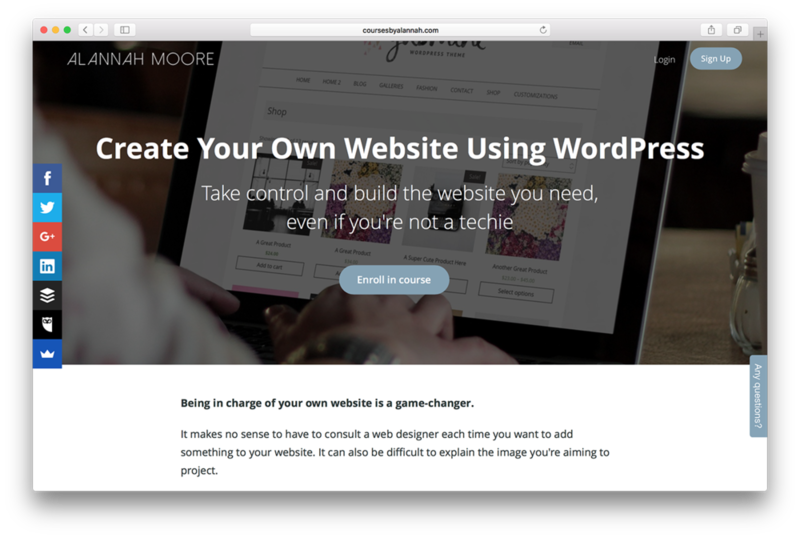 Whatever kind of website you have – WordPress, Squarespace, or any other – you can use these tools, and it takes just a few clicks to install.